The Target Marketing Systems Wood Corner Desk with One Drawer and One Storage Shelf is the Perfect Addition to Any Home. Whether You're Looking to Save Space or Just Need to Fill Some Empty Space in Your Home, the Corner Desk is the Way to Go. Measuring 42" X 28" X 30" and Weighing 42 Lbs, the Small Corner Desk Comfortably Fits into Any Corner or Awkward Space in Your Home. It's Size also helps Maximize Space in Smaller Rooms, Making it An Ideal Piece for Apartments, Lofts, or Studios. With Enough Tabletop Space for a Desktop Display or Laptop, the Corner Desk can be used as a Work Station. Have A Lot of Miscellaneous Items that Won't Fit on the Desk? No worries! The Corner Desk also comes with One Drawer and One Shelf for Extra Storage Space. Made from High Quality Wood, the Small Corner Desk is Sturdy, Durable, and Easy to Clean. Since 1985, Target Marketing Systems has been Offering Top-Notch Furniture at Affordable Prices. That Goal has not Changed and TMS will Continue to Give You the Best. 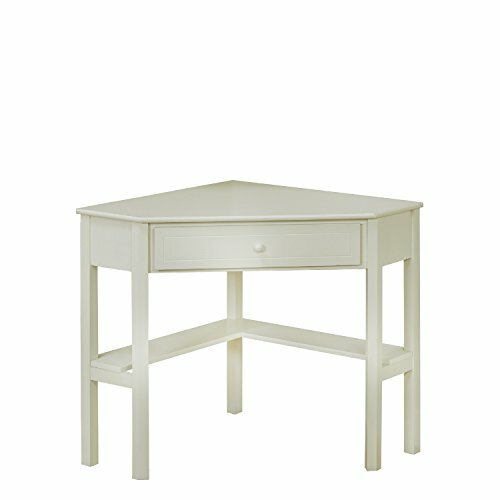 Made from High Quality Wood, the Small Corner Desk is Sturdy, Durable, and Easy to Clean.